This boho-themed watercolor collection brings artistic cultivation to folksy motifs. It melds the floral, the spiritual, the ornamental, the feathered, and the recently washed ashore. Over 250 free-spirited objects principally composed of understated pinks, blues, purples, and greens profess Bohemian elegance. Crafted with love for all free spirits and those who believe that this world is but a canvas to our imagination. 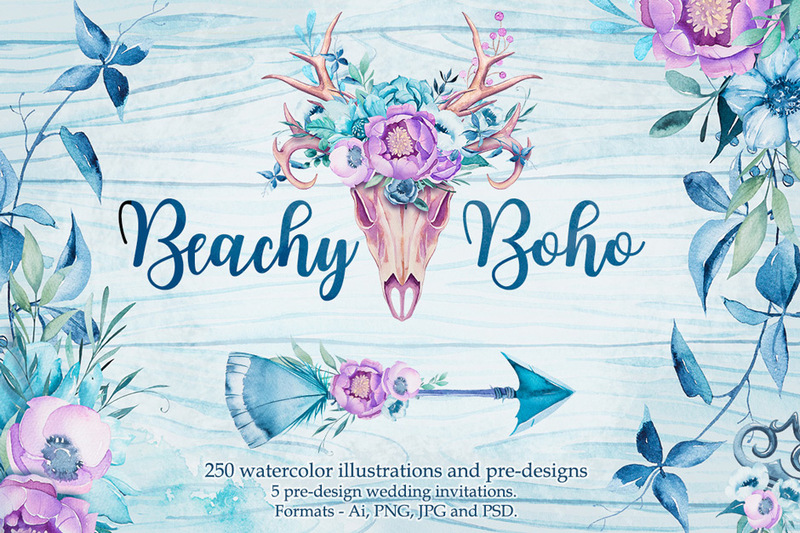 Illustrations include arrows and keys, dream catchers, skulls and horns, flowers, seashells, delicate watercolor textures, wooden objects, beads, seamless patterns, wreaths and bouquets, feathers, and flowers and fronds – plus wedding invitations. These vectorized works look spectacular on shirts, canvas bags, and other textiles, as well as on cards and announcements of all kinds. File size is approx 1.9 GB (2.7 GB unzipped), offered as a single download.